On Thursday, September 26 at 8:15am, 2 workers from the Alta Gracia Factory in the Dominican Republic will be on Creighton’s campus in Lower St. Johns. If you are interested in hearing about the effects on lives and communities when workers are offered a living wage and good working conditions, this will be an event you won’t want to miss. As a campus who purchases tens of thousands of pieces of apparel each year, this is not an issue to take lightly. Underneath this poster, you will find reflections by Selina Marshall, a Creighton Student studying in the DR who has had the opportunity to go and visit the Alta Gracia factory! Comunidad 16 recently traveled to Alta Gracia, located in Villa Altagracia, here in the Dominican Republic, where we got to tour the factory, got to know the workers, and saw how Alta Gracia is impacting the lives of its workers. 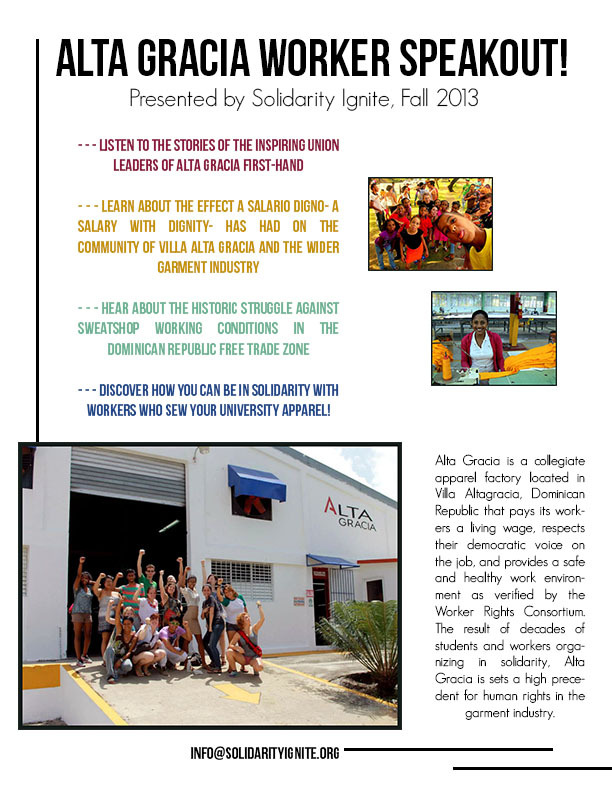 Alta Gracia, which translates to “High Grace,” is the only factory in the world that supplies U.S. university bookstores with union-made apparel. The workers at Alta Gracia all receive a living wage, which is more than three times the minimum wage in the Dominican Republic; thus, providing the workers a pathway to get out of poverty. This “living wage” is the equivalent to $2.83 per hour in U.S. dollars, and the Dominican minimum wage is only $.84 per hour. It was personally difficult to accept that the wages these workers receive are so little in U.S. standards. It was even more disheartening to learn that the conditions and wages of Alta Gracia are far from the norm in factories here in the Dominican Republic, especially in the Free Trade Zones. Before the creation of Alta Gracia, the factory was home to far worse conditions, where many of the workers were unable to provide for their families because the wages were so low. Workers also suffered because of the conditions in the factory. They were unable to get water as they pleased, or even go to the bathroom at their own will. When the workers tried to unionize, the previous company closed down operations and moved to another area, leaving those workers unemployed. Unfortunately, this is the reality for many workers around the world because the demand for jobs is so high. Companies know they can go somewhere else if employees begin to fight for better conditions and wages. Thankfully, Alta Gracia came into the lives of these particular workers. We were able to meet with the workers and learn about their stories of hope and thankfulness due to Alta Gracia. We were welcomed into the homes of two women who were able to build homes for their families, something that would have never been a reality without the living wage they now receive. One of these women even revealed to us that before Alta Gracia, she was not even able to promise her children more than one meal a day. The workers at Alta Gracia are now able to save some of their earnings, which is allowing them to emerge step by step out of poverty. It was amazing to see the impact of Alta Gracia in these people’s lives, and it is something that is seen in the smiles of everyone in the factory. They are all happy to do their work because of all the blessings they are receiving from Alta Gracia. It was so encouraging to see this type of business model function, and be successful, selling apparel in over 450 U.S. university bookstores. Even more encouraging is to know that Creighton is among these universities, and that we can all do our part by sharing the good news of Alta Gracia on campus, and by encouraging everyone to change lives with the purchase of Alta Gracia clothing.